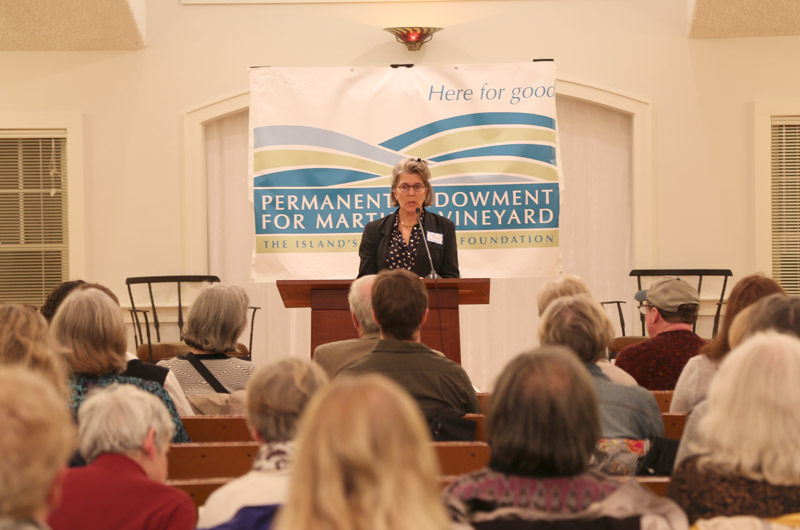 Emily Bramhall, executive director of the Permanent Endowment for Martha's Vineyard, speaks at the grant awards ceremony. 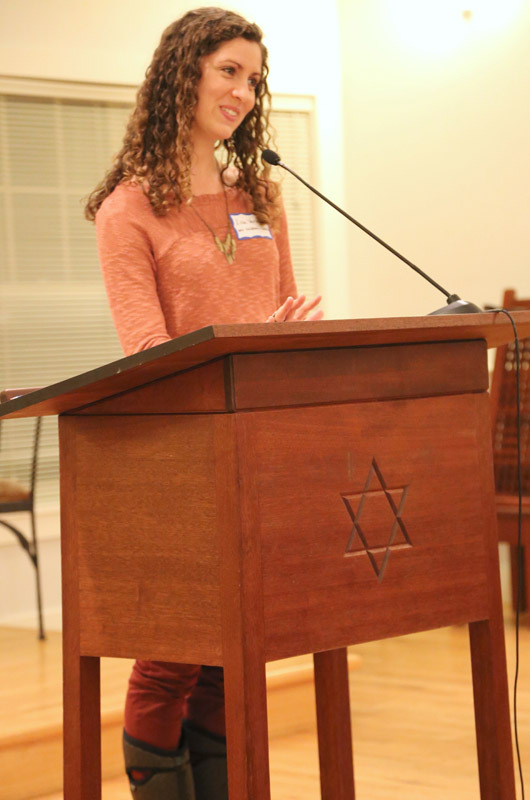 On Tuesday night, members of the community gathered at the Martha’s Vineyard Hebrew Center to celebrate the first inaugural Permanent Endowment for Martha’s Vineyard grant awards ceremony. The organization was created in 1982 and manages 39 individual funds that award grants for specific tasks, such as moving the Gay Head Lighthouse, or for the broader goals of a nonprofit, including strategic planning. This year the endowment received 40 grant applications. After reviewing the applications and conducting interviews, 25 nonprofits were awarded $155,000 for art, community, environmental and health and human services programs. The awards ceremony featured a reception followed by short presentations from many of the grant recipients. Martha’s Vineyard Savings Bank’s Tim Madigan and Paul Falvey presented checks to the Martha’s Vineyard Center for Living for their supportive day program, and to the Martha’s Vineyard Film Festival for children’s programming. Managing director Brian Ditchfield said that the grant money will go towards free filmmaking workshops for Island youth, including a documentary project that will take young filmmakers on an off-Island adventure to the Bronx, rural Kentucky and other places around the country. While many of the recipients were established Island nonprofits, there were some new organizations that received recognition in the form of grant money. Lisa Varno created the Martha’s Vineyard Children’s Chorus after moving to the Island last year and accepted her first grant for the program. The Cape and Island’s United Way also attended the ceremony as a guest funder. Chief executive officer Barbara Milligan spoke about the United Way’s commitment to serving the needs of the Island community. Chip Seadale accepted a grant for the Housing Assistance Corporation. Reverend Chip Seadale accepted a grant from the United Way on behalf of the Housing Assistance Corporation. Last January, members of the Island’s church community set up short term emergency housing for individuals and families in need during the cold winter months. 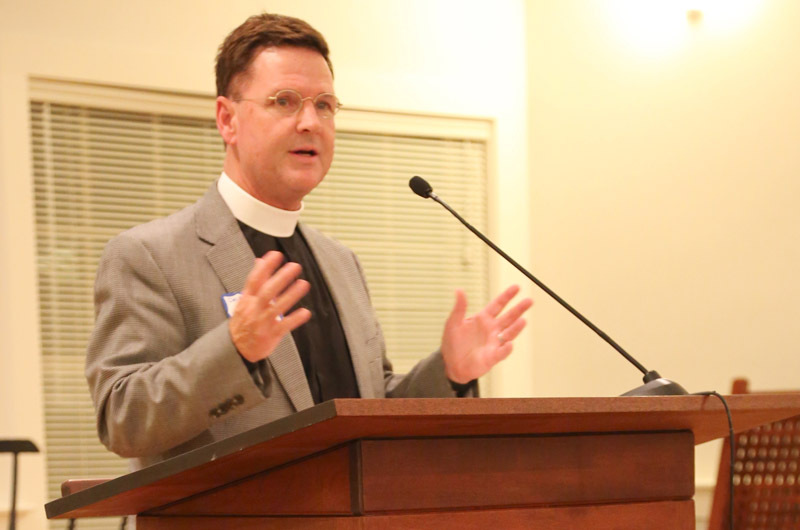 He said that as of November, 70 members of the community were without housing. “We still have more work to do, there are people out there that need our help,” he said, adding that the grant money will help house Islanders in need in hotels and one room apartments temporarily through the winter months. To close the ceremony, Ms. Bramhall introduced Austin Grande who spoke about the impact the endowment’s funding has had on his life. Mr. Grande was awarded a scholarship by the endowment to pursue a Coast Guard captain’s license course and also benefitted from the services of Vineyard House and Sail MV. Arts: Martha’s Vineyard Chamber Music Society, Martha’s Vineyard Children’s Chorus and Featherstone Center for the Arts. Community: ACE MV, Good Shepherd Parish, Martha’s Vineyard Community Services, Sail MV, Shenandoah Foundation, Martha’s Vineyard Hospital, Martha’s Vineyard Museum and Vineyard House. Environmental: Biodiversity Works, Great Pond Foundation, Martha’s Vineyard Shellfish Group and Sheriff’s Meadow Foundation. Human Service: Healthy Aging Martha’s Vineyard, Martha’s Vineyard Cancer Support Group, Martha’s Vineyard Center for Living, Island Elderly Housing, Rising Tide and Windemere.